The 63rd Porsche Parade was held at Lake of the Ozarks, Missouri the second week of July. Zone 7 had only a couple dozen attendees this year. However we came home with a good number of awards. Jessica (GGR) and J Toney (SVR) again took 1st place in their TSD Rally class and Overall Winners of the Parade TSD Rally for the second year. Tom Provasi (LPR) driving with his brother Ken took 1st in class and 2nd overall behind the Toney duo. Andrew Blyholder (GGR) took Top Time of Day for the men at the Parade Autocross with his fast 914. Terry Zaccone (GGR) also won his class in Marcel. Tom Provasi and myself both took 1st in the Cayman class thanks to Tom’s brother letting us borrow his Cayman. Zone 7 also had Michael Hinton (RR) take 1st in the Early 911 Tech Quiz class along with Andrew Blyholder taking 4th in the 914 quiz. In the Art Show, Caroline Doberenz (DR) received 1st in her class and also People’s Choice award for her knitted Porsche crest blanket. Parade doesn’t happen without a lot of volunteers. Rik Larson (SVR) co-chairs the Parade TSD Rally and Larry Sharp (DR) chaired the Parade Autocross. I hope I didn’t forget anyone! 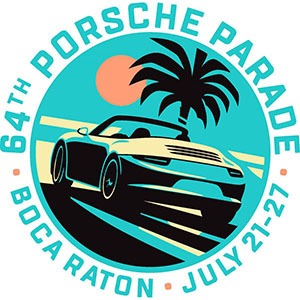 Looking forward is the 64th Porsche Parade 2019 to be held in Boca Raton, Florida at the Waldorf Astoria, July 21-27, 2019. It was also announced that Parade 2020 will be held in the Greater Palm Springs area, June 21-27, 2020. Save the dates. 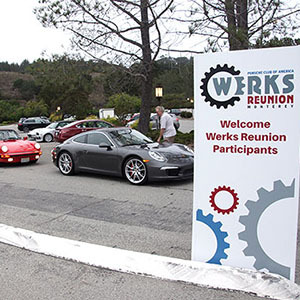 Over the next two months Zone 7 will need a lot of volunteers to help with Werks Reunion Monterey, PCA Corral at Laguna, Porsche Platz at Laguna and Rennsport Reunion at Laguna. If you are attending one or all of these events, please, please volunteer. For all events at Laguna Seca Raceway you will need to purchase a race ticket. It is amazing whom you meet and the fun you have when you volunteer with other Porsche enthusiasts. You can email me at sandyprovasi@gmail.com and I will forward to the correct person.